There is something surreal about the coverage of developments this week at the UN. The general tenor is akin to the showdown at the OK Corral. Either the Palestinians win recognition of statehood, or they don’t. If they do, they win. If they don’t, Israel wins. The problem with this message is that even if the Palestinians don’t receive UN membership they still win. There is no scenario in which Israel wins at the UN. The reason is simple. The UN is profoundly hostile to Israel. It has a large, permanent, automatic majority of members that always supports harming Israel. In the present circumstances, the best case scenario for Israel is that the Palestinians bring their membership resolution before the Security Council and the US immediately vetoes it. If that happens, at least we’ll have closure in this particular fight. But even such a “victory” will have little lasting effect. There is nothing preventing the Palestinians from reinstating their membership request whenever they want. And given the sympathy their current membership bid has won them, the Palestinians have every reason to repeat the process again and again and again. By Thursday, it appeared that the most likely outcome of their present statehood bid will not be a quick US veto in the Security Council, but rather something much worse for Israel. On Wednesday morning, talk had already begun of a long, drawn out period of deliberation at the Security Council which could last weeks or months or even longer. The idea is that during that time, the US and the Europeans will place massive pressure on Israel to make more concessions to the Palestinians in order to restart stillborn negotiations. And the specter of a Security Council endorsement of Palestinian statehood will loom over Israel’s head the entire time like the Sword of Damocles. Rather than wash its hands of this loser’s game and move its policies to a diplomatic battlefield where it has a chance of actually winning, the Netanyahu government is playing out its losing hand as if what Israel does makes a difference. Even worse, the government is refusing to consider crafting a strategy for victory that it can advance outside the hostile confines of the UN. This is not simply a failure of imagination. It is a failure of cognition. It is a failure to notice the significance of what is already happening. Israel’s friends in the US Congress have put forward two measures that pave the way for just such a strategy for victory. By failing to recognize the opportunity they represent for Israel, the government is showing a distressing lack of competence. The government’s behavior is probably due to force of habit. Since the initiation of the phony peace process with the PLO 18 years ago, at their best, Israel’s governments have justified the Jewish state’s control over territories it won control over in the 1967 Six Day War on the basis of our security needs. Without the Jordan Valley, Israel is vulnerable to foreign invasion from the east. Without Gush Etzion to Jerusalem’s south and Gush Adumim to its north, the capital is vulnerable to attack. Without overall Israeli security control over Judea and Samaria, Israel’s population centers are vulnerable to terrorist attacks. And so on and so forth. All of these statements are accurate. But they are also defensive. While Israel has been defending its right to security, the Palestinians have been on the offensive, arguing that all the land that Israel took control over from Jordan in 1967 belongs to them by ancestral right. And so for the past 18 years, the conflict has been framed as a dispute between the Palestinians’ rights and Israel’s security requirements. Like its willingness to place itself at the UN’s mercy, Israel’s willingness to accept this characterization of the Palestinian conflict with Israel has doomed its cause to repeated and ever-escalating failure. For if the land belongs to the Palestinians, then whether or not their control of the land endangers Israel is irrelevant. This is the reason the US’s support for Israel’s right to defensible borders has been reduced from support for perpetual Israeli control over unified Jerusalem and some 50 percent of Judea and Samaria in 1993, to US support for a full Israeli withdrawal to the 1949 armistice lines – including the partition of Jerusalem – in 2011. You can define “defensive needs” down. Defining rights down is a more difficult undertaking. The irony here is that Israel’s sovereign rights to Judea and Samaria are ironclad while the Palestinians’ are flimsy. As the legal heir to the League of Nations Mandate for Palestine, Israel is the legal sovereign of Judea and Samaria. Moreover, Israel’s historic rights to the cradle of Jewish civilization are incontrovertible. And yet, because Israel has not wanted to impede on the possibility of peaceful coexistence with the Palestinians, for the past 18 years it has avoided mentioning its rights and instead focused solely on its security requirements. Consequently, outside of Bible-literate Christian communities, today most people are comfortable parroting the totally false Palestinian claim that Jews have no rights to Judea, Samaria or Jerusalem. They further insist that rights to these areas belong exclusively to the Palestinians who did not even exist as a distinct national community in 1967. As for Israel’s allies in the US Congress, they have responded to the PLO’s UN statehood gambit with two important legislative initiatives. First Rep. Ileana Ros-Lehtinen, chairwoman of the House Foreign Affairs Committee, introduced a bill calling for the US to end its financial support for the Palestinian Authority and drastically scale-back its financial support for the UN if the UN upgrades the PLO’s membership status in any way. Ros- Lehtinen’s bill shows Israel that there is powerful support for an Israeli offensive that will make the Palestinians pay a price for their diplomatic aggression. Ros-Lehtinen’s bill is constructive for two reasons. First, it makes the Palestinians pay for their adversarial behavior. This will make them think twice before again escalating their diplomatic warfare against Israel. Second, it begins an overdue process of delegitimizing the Palestinian cause, which as is now clear is inseparable from the cause of Israel’s destruction. Were Israel to follow Ros-Lehtinen’s lead and cut off its transfer of tax revenues to the PA, and indeed, stop collecting taxes on the PA’s behalf, it would be advancing Israel’s interests in several ways. It would remind the Palestinians that they need Israel far more than Israel needs them. Israel would make them pay a price for their diplomatic aggression. Israel would end its counterproductive policy of giving the openly hostile PA an automatic seal of approval regardless of its treatment of Israel. Israel would diminish the financial resources at the PA’s disposal for the advance of its war against Israel. Finally, Israel would pave the way for the disbandment of the PA and its replacement by another authority in Judea and Samaria.
. Earlier this month, Rep. Joe Walsh and 30 co-sponsors issued a resolution supporting Israeli annexation of Judea and Samaria. 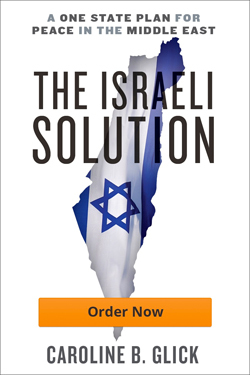 While annexation sounds like a radical formula, the fact is that Israel already implemented a similar move twice when it applied Israeli law to Jerusalem and to the Golan Heights. And the heavens didn’t fall in either case. Indeed, the situation on the ground was stabilized. Moreover, just as Israel remains willing to consider ceding these territories in the framework of a real peace with its neighbors, so the application of Israeli law to Judea and Samaria would not prevent these areas from being ceded to another sovereign in the framework of a peace deal. And while not eliminating the prospects of a future peace, by applying Israeli law to Judea and Samaria, Israel would reverse one of the most pernicious effects of the 18-year-old phony peace process: the continuous erosion of international recognition of Israel’s sovereign rights to these areas. With each passing round of failed negotiations, offers that Israel made but were rejected were not forgotten. Rather they formed the starting point for the next round of failed negotiations. So while then-prime minister Ehud Barak for instance claimed that his offer to cede the Temple Mount was contingent on the signing of a peace treaty, when the so-called Middle East Quartet issued its road map plan for peace, Barak’s ostensibly canceled offer was the starting point of negotiations. By applying Israeli law to Judea and Samaria, Israel would change the baseline for future negotiations in a manner that enhances its bargaining position. Perhaps most important, by applying its laws to the areas, Israel would demonstrate that it finally understands that rights need to be asserted by deeds, not just by words, if they are to be taken seriously. On Thursday, The New York Times published a news story/analysis that essentially rewrote the history of the last two-and-a-half years. The paper ignored Palestinian leader Mahmoud Abbas’s open admission that US President Barack Obama compelled him to radicalize his own policies towards Israel when Obama demanded that Israel abrogate Jewish property rights in Jerusalem, Judea and Samaria as a precondition for negotiations. This was a precondition the Palestinians themselves had never demanded. And by making it a US demand, Obama ended any possibility of resuming negotiations between the Palestinians and Israel. By the Times’ telling, Obama is a victim of the combined forces of an intransigent Israeli government and the pro-Israel lobby that holds sway in Congress. These nefarious forces made it impossible for Obama to bring the sort of pressure to bear on Israel that would have placated the Arab world and paved the way for a peaceful settlement. And in the absence of such presidential power, Israel and its lobbyists wrecked Obama’s reputation in the Arab world. The lesson that Israel should take from the Times’ borderline anti-Semitic historical revisionism and conspiracy theories is twofold. First, Israel will never be rewarded for its concessions. The Times and its fellow anti-Israel activists don’t care that since 2009 – and indeed since 1993 – Israel has made one concession after another only to be rewarded time after time with ever-escalating demands for more concessions. The Times and its fellow Israel-baiters have a story of Israeli conspiracies and bad faith to tell. And they will tell that tale regardless of objective facts and observable reality. This brings us to the second lesson of the Times article, specifically, and the experience at the UN generally. Israel has nothing to lose and everything to gain from going on the offensive. Our friends in the US Congress have shown us a path that lays open to us to follow. And we must follow it. Since we’ll be blamed no matter what we do, we have no excuse for not doing what is best for us.